It’s often reported that sitting all day at work is bad for one’s health, with various sites claiming it will increase the risk of diabetes, heart disease and ultimately shorten your life. A rather dark infographic highlighted that sitting for six hours or more a day will increase the risk of death by up to 40%. 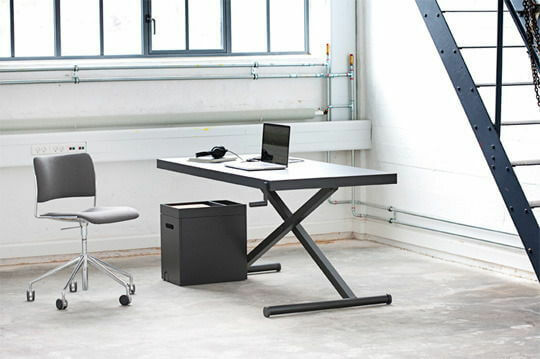 These reasons alone should be enough of a selling point for this adjustable desk named the XTable, designed by KiBiSi, a Danish design studio. The desk adjusts manually through the use of a mechanical hand crank, which in turn saves energy thus making it eco-friendly plus it keeps the user active when they decide to swap from sitting to standing. The adjustability of XTable makes it comfortable for anyone of any height to use, unlike standard tables.